Almost every diamond will have some form of imperfection in it, because it is a natural material. Diamond valuers grade diamonds according to the level of imperfections, referred to as the level of clarity. There are two characteristics of diamond which determine its clarity: inclusions; and blemishes. The former are imperfections within the diamond. These may take the form of cracks, unevenness or changes in texture within the diamond. Blemishes are of a similar nature but occur on the surface of the diamond. To determine what grade the clarity of the diamond may be, it is assessed by a trained professional, using a magnifying device which provides 10x magnification to spot any blemishes or inclusions. It is worth remembering that the vast majority of imperfections, be they blemishes or inclusions, are visible to the naked eye. These are very, very tiny imperfections which largely determine the value of the diamond rather than its appearance. 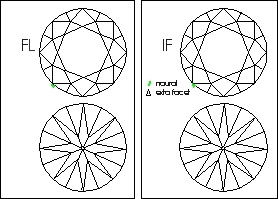 A diamond’s clarity rating is based on the size, number, and location of internal and external characteristics. Known as inclusions, internal characteristics include crystals, clouds, and feathers. External characteristics, or surface irregularities, are called blemishes. As most inclusions can’t be seen by the naked eye, gemologists use a ten-power (10x) microscope to rate a diamond’s clarity. These diamonds have tiny, tiny blemishes and inclusions which a skilled grader can just make out using a 10x magnification. 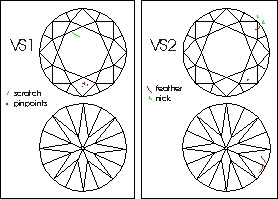 Very slightly included (VS) diamonds have inclusions which a trained grader finds either difficult, somewhat easy or somewhere in between to spot under 10x magnification. 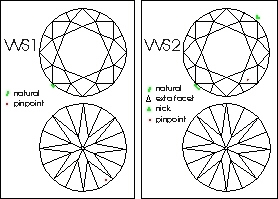 Divided into two different grades, diamonds in the lower grade (VS2) occasionally have imperfections which are visible to the naked eye. SI diamonds (Slightly Included) diamonds have imperfections which are easy to very easy for a trained grader to spot under 10x magnification. It is estimated that around a third of diamonds which are sold fall into the SI1 or SI2 category. 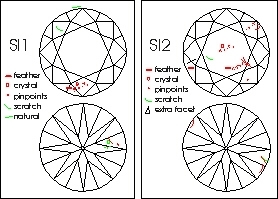 Included diamonds (I1, I2 and I3) have the largest inclusions. I3 diamonds have the largest inclusions, which may be big enough to compromise the integrity of the stone. It is important to remember that for the vast majority of diamonds the flaws are invisible to the naked eye. A classic error is to pay far too much for a diamond which has a higher clarity grade, even though the increased price will not be reflected in the appearance of the stone. In the vast majority of cases, the imperfections are not visible to the naked eye by quite a significant margin. This means that a ring will look the same whether the stone is an SI1 or a VVS1 regarding clarity. The only thing which will alter will be the price. For most purposes, VS diamonds or SI diamonds are ideal, there is no need to pay a much higher price for an IF diamond or similar. The size and cut of the stone also needs to be taken into consideration when deciding on a suitable degree of clarity: your jeweler is best placed to advise you on the level of clarity which is going to work best for your particular piece.